Earn up to 3,545 reward points. A professionally upgraded Les Paul Custom with looks that kill. The king of solid body guitars, the Les Paul Custom made its debut in 1954 after the initial success of the Les Paul Goldtop. Les Paul himself suggested black as a great color for a new Les Paul because it looked "classy" and went well with a tuxedo on stage. 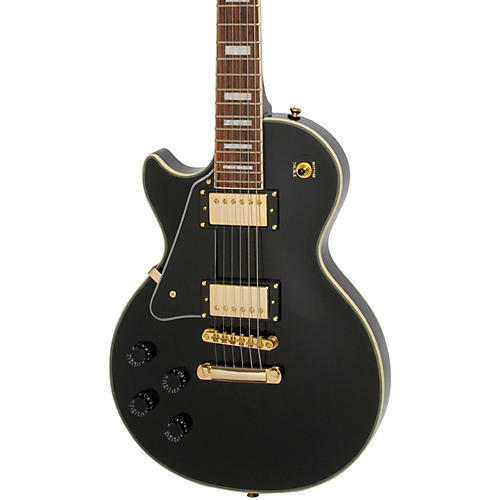 Now with its ebony or antique white finish, the Les Paul Custom has often been referred to as the "tuxedo" Les Paul. And with its gold appointments, fully bound body, neck and headstock and mother-of-pearl inlays, we think you'll agree that the Epiphone Les Paul Custom is "dressed to kill". Now featuring ProBucker 2 and ProBucker 3 humbucking pickups with coil-split, gold hardware, multi-binding on body (top and back), neck and headstock as well as split-diamond mother-of-pearl headstock and fretboard inlays, it's as gorgeous as it is deadly.